This article is Day #17 in a series called 31 Days of Windows 8. Each of the articles in this series will be published for both HTML5/JS and XAML/C#. You can find additional resources, downloads, and source code on our website. We’ll write some code in this article that shows not only how to copy and paste these values, but also how to detect which type of data the clipboard currently contains. As we saw briefly in yesterday’s article on context menus, we took a very quick look at saving some text to the clipboard. This time, we’ll cover that in more depth, and include saving images and files to the clipboard as well. To get started, we should talk about the DataPackage object. A DataPackage is what we are going to use to transport our data. We will create a DataPackage when we save data to the clipboard, and we will use the Clipboard.GetContent() method to retrieve the data when we’re pasting it. In my sample project (which you can download from GitHub), you will see that I’ve created a button with an event handler for each data type. We’ll spend the rest of this section looking at how we store these different types of data to the Clipboard. It is important to note that the clipboard is actually divided into several sections, one for each data type. You can save data to one or many of these sections, and the target for pasting will make the determination as to what type of data it will display when pasted. This might sound very similar to how the Share Contract works, and for the most part, it is. You will see a pattern form as we move through the other examples, but this is about as basic as they come. We create a new DataPackage object, call the SetText() method with the text we want to save, and then set the content of the Clipboard to that DataPackage. HTML, while similar to text, has its own quirks and formatting, and because of this, requires slightly different treatment when adding it to a DataPackage. In this example, I am grabbing the HTML source from a WebView control (HTMLSource), and using that as my DataPackage contents. However, I am also setting the SetText() value of this DataPackage, so that you can see how multiple values can be set at the same time. Our next example is images, and I want to be really clear on this one. We’re not talking about a file that happens to be an image. We’re talking about copying an image from a website, for example, and then pasting it into a OneNote file or Windows Live Writer. In my example, I am allowing the user to copy an image from my application to their clipboard. In the image example, we are grabbing the image from its location in our project, creating a StorageFile from it, and then setting the SetBitmap() content of the DataPackage with it. As with all of the examples in this article, we end our code with Clipboard.SetContent() to actually complete the action. Files are treated very similarly to images, but there’s one major difference: we can copy multiple files to the clipboard at once. You’ve done this before, highlight and grab some of the files cluttering up your desktop before dragging them as a group to the Recycle Bin. Instead of throwing them away, you could cut/copy them, and paste them to another location. Files are always passed as a collection of files, even if there is only one. 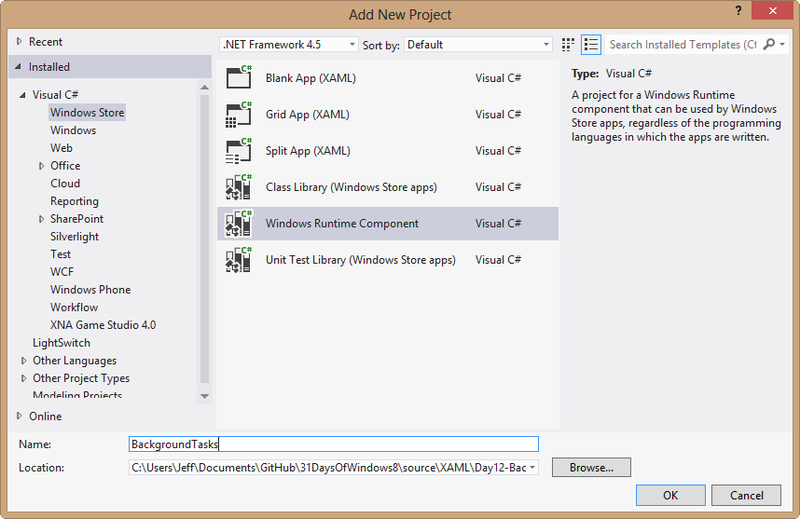 Simply set the Build Action of your file to “Content” by looking in the Properties pane of Visual Studio 2012. So, as far as saving content to the Clipboard, that’s just about it! Our next step is going to be retrieving it from the Clipboard when the user chooses to paste it. When it comes to “getting pasted” as I’ve started saying, I tend to do this all in one method that gets the content, determines which data type is available, and displays the content correctly based on that determination. I had hoped, when writing this article, that there was going to be some amazing event handler, like OnPastedTo() or something, that would recognize when the user is attempting to paste some content to the app, so that we can take action on it. (I personally live and die with Ctrl + X, Ctrl + C, and Ctrl + V). I have not found that event yet, but if/when I do, I will update this page. For now, I’ve created my own event handler that fires when you click a button. You’ll see, in the example below, that I call the GetContent() method on the Clipboard, and then use a series of IF statements to act on the content appropriately. Let me quickly discuss each of the IF statements. For text, I simply grab the Text data and place it in a TextBlock control on my page. For an image, I need to convert the Image data to a BitmapImage object before I can set it as the source of an Image control. For files, I loop through the collection of files, saving each of them as local files in my application, and then write the name of the file and the location of the folder to a TextBlock. Finally, for HTML, I grab the HTML source, and, using a WebView control, navigate the control to the HTML source that I have received. In all it’s pretty simple, but I was delighted the first time that I copied content from a webpage directly into my app, and it just worked! The same is true for images, text, and files. I highly recommend grabbing the source of this project and playing with it. It will really help you to understand exactly how the clipboard is being used by your other applications. Today, we took a deep look at the Clipboard, and how we can save and retrieve data as needed. It supports several different file types, and I think you’ll be surprised just how redundant most of your favorite applications are when they save data to the Clipboard. Tomorrow, we’re going to add another useful tool to our Windows 8 development tool belt: the FilePicker. We’ll look at retrieving files from the user’s device, and even filtering them so that we only get our preferred file types. See you then! This article is Day #16 in a series called 31 Days of Windows 8. Each of the articles in this series will be published for both HTML5/JS and XAML/C#. You can find additional resources, downloads, and source code on our website. Today, our focus is on context menus. These are those small little popup commands that appear from time to time in your application when you right click on something. 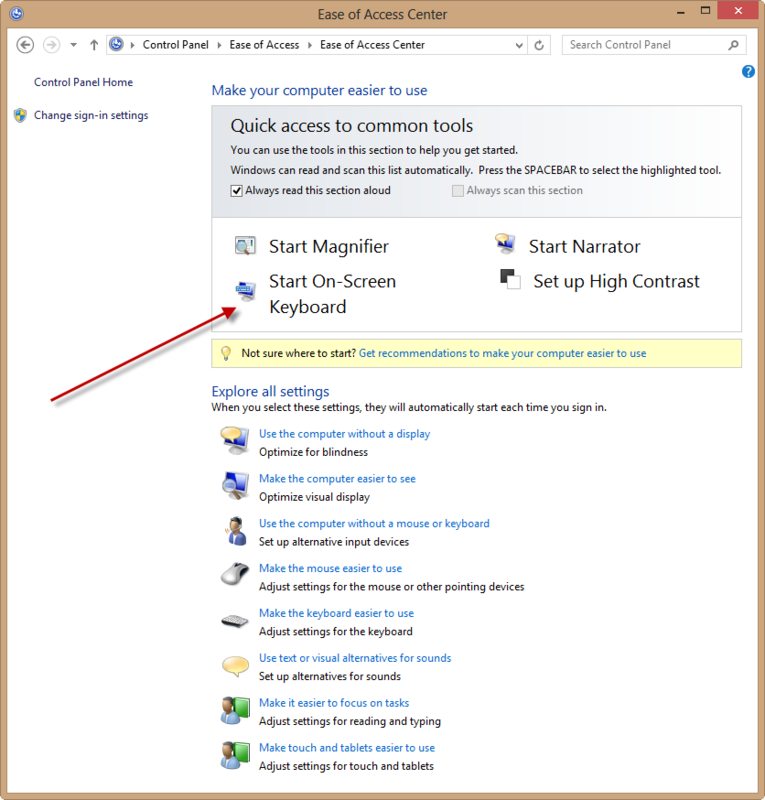 Microsoft offers some very specific guidance on when to use these context menus vs. when to use the AppBar control instead, so we will be following those rules in this article. Right-clicking the image launches the context menu to the right. (I will show you how to make this happen next.) Each of the command items will have an action assigned to it, which is executed when the item is clicked. The first is the Rect value that we are retrieving from our GetRect() method. Pass the sender in, get the appropriate Rect in return. The second is the placement of the context menu. In my example, I set Placement.Right as my value. You have four options, but don’t go crazy with this. Microsoft’s guidance on context menus is that “they should appear above the object they are acting upon, unless it obscures other UI elements, in which case, moving it to the side or below the object is acceptable.” Keep the experience in Windows 8 consistent for your users unless you have a good reason to do otherwise. That’s about it! You should now be able to add contextual menus to your applications when AppBars and other UI don’t make sense. But what about interacting with just some of the text in a TextBox? As it turns out, you can’t. So, for our example, let’s say that we want to keep all of those options, but also add a new one titled “Delete” at the bottom. To do this, we first need to override the default context menu by creating an event handler to cancel the default one, and then recreate all of the functionality of the old one. I also created a statement to remove this event handler when we leave the page. In the method that this event handler calls, we will cancel the initial call with Handled = true, and then create our own context menu that still makes all of the appropriate calls to the clipboard. We are only going to briefly cover using the Clipboard in this article, but we will spend the entire article tomorrow on the different ways to use this great tool. Today we looked at the art of creating inline context menus for our users. They are an excellent way to provide interactions with elements that aren’t selectable, or for commands that make more sense directly adjacent to the element being interacted with. Tomorrow, as promised, we will venture further into the Clipboard functionality available to us in Windows 8 development. See you then! The primary reason for this is because this is one of the few times that Windows 8 makes a distinction between a mouse click and and finger tap. 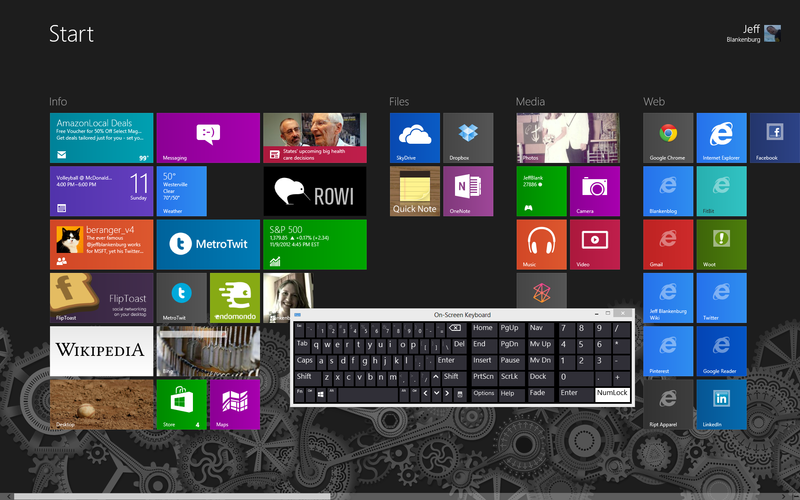 If you mouse click on a TextBox, Windows 8 assumes you are using a real keyboard, even if you’re using a touch-enabled machine. A finger-tap, however, will produce that keyboard we’re going to talk about today. The rest of the InputScope values are generally focused on East Asian languages, and while I mean them no disrespect, I don’t know enough about those character sets to have an intelligent discussion about the subtle differences between FullWidth and HalfWidth characters. In the past, I have written articles about TextBoxes and virtual keyboards, and went on and one about the use cases where you want to pop-up the keyboard without showing the user their input. A great example of this might be the game HANGMAN. You want the user to be able to choose a letter, but then you want to dismiss the keyboard so that the user can see their progress. Tomorrow, we are going to dive into using Context Menus to offer our user contextual commands directly on the app surface. See you then! This article is Day #14 in a series called 31 Days of Windows 8. Each of the articles in this series will be published for both HTML5/JS and XAML/C#. You can find additional resources, downloads, and source code on our website. Know which plant your field manager is visiting today, so that he has all of the appropriate documentation for the machinery in that facility. In addition, your app could surface the photos and names of the employees in that facility, so that they are more prepared and personable when they arrive. Identify other nearby players, and make an opportunity to match them up in game. It will not only potentially improve network latency for them, but you might also form a guild out of nothing. Create a global game of tag, based solely on proximity, not touching. Duh. We’ll do this as part of the sample code today. Recognize the user’s distance and potential travel time from the airport, and alert them to the impending urgency to leave before missing their flight. In addition, once you’ve established they can’t make it on time, help them find the next available flight without the user having to find it on their own. There are tons of apps available to track your exercise route. Think running, cycling, etc. The obvious application of geolocation to these apps is the ability to map the route you took during your travels. A more important one, however, and I think this responsibility probably falls to the mobile OS manufacturers themselves, is the ability to recognize an accident. On average, 4500 cyclists a year are victims of hit-and-run situations, where they are left injured (or worse) on the side of the road. In today’s world, nearly everyone has their phone with them, even when running or cycling. Imagine that your phone is capable of recognizing a large impact (using accelerometer or gyroscope data), followed by no movement at all. After 30 seconds of no movement, your phone prompts you to call 911 and send text messages to a pre-selected list of contacts with an SOS message and your location. After 30 more seconds, it immediately sends that information and dials 911. This functionality could save lives, as many of these cyclists die needlessly only because nobody knows where they are. Sorry for being so morbid, but it’s an important thing to think about. As you can see there is always a way to take location data and make your app even better. In addition, if you love my ideas above, you are completely welcome to steal them outright. I will likely never build any of those apps, specifically. There needs to be 48 hours in every day to make that happen. Thankfully, getting our geolocation data is pretty easy, and as usual, we have to declare that Location is one of our capabilities in order to use it. 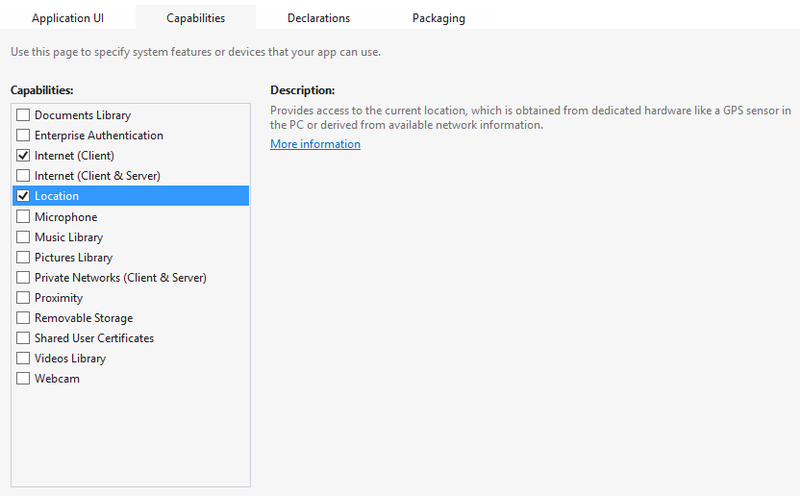 To do this, open the Capabilities section of your package.appxmanifest file, and check the Location box. If you skip this step, and just try implementing the code in the rest of the article, you won’t get any errors, but you also won’t get any data. As you might have guessed, this is an event-driven operation. When my page loads, I create a new Geolocator object, and add two events: PositionChanged and StatusChanged. PositionChanged is the important one. This is where we get all of the useful data like Longitude, Latitude, and Accuracy. All of these values come from the Geocoordinate class, and as you can see from the code above, there’s several more. Timestamp is the actual time that the Location value was read. 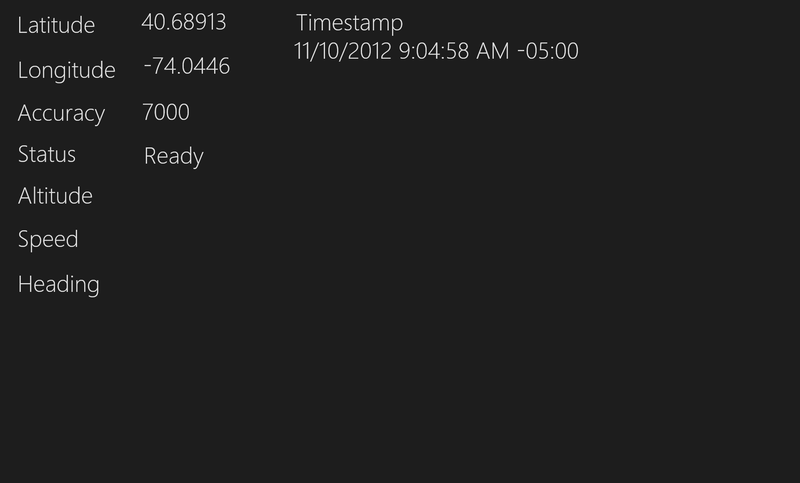 This includes timezone information, so you’ll have to convert the times to store everything in UTC. Altitude is the elevation of the device, in meters. This is likely only to be found in devices with a barometer (we will cover sensors later in this series), but it’s a valuable piece of information if you can get it. AltitudeAccuracy is just like our other Accuracy value, except that it is simple the margin of error for the Altitude value. It means you are + or – this many meters. Heading will also only be displayed with the appropriate sensor, the compass. This is measures in degrees relative to true north. Speed can technically be calculated by tracking the lat/long values over time, but they’ve made it incredibly easy for us. It is measured in meters/second, but is an optional value that the device’s GPS sensor can provide. This means that not all devices will return a value. notInitialized is returned when your application has not yet requested permission to access the location data. disabled is the value you will get when the user declines your request to access their location information. notAvailable is returned if the user’s device does not support location data. noData is returned if the user’s device supports location, but can’t acquire any. This could happen in a scenario where the device is not connected to wi-fi, and is inside a buiding, for example. initializing is the status value you’ll receive between the time the user grants access to location data, and the time you actually start receiving that data. In future uses of your app, this will also be sent when your app is waiting to access location data for the first time. ready is the golden response, and lets you know that data is available for your use. So the example I’ve provided you in this article allows you to recognize every time your user’s location data changes, and one that has millions of use cases for. If you only need this data ONCE, say to tag an image that the user has just taken, you just make a request to the Geolocator object without having to create all of the events I’ve outlined above. In the method below, we can make one simple call to the GetGeopositionAsync() method instead. In this case, we just need one simple value, one time. Do not create a loop that makes this call over and over, it’s much slower, and you’ll save tons of machine resources by following the earlier example that registered event handlers. Today, we talked about Geolocation data, and how important it can be to any application in the market. We looked at tracking a user’s location, as well as getting their location once, for applications that just need the specific location “right now,” but not all the time. Tomorrow, we are going to look at the on-screen keyboard, InputScopes, and TextBoxes. See you then! This article is Day #13 in a series called 31 Days of Windows 8. Each of the articles in this series will be published for both HTML5/JS and XAML/C#. You can find additional resources, downloads, and source code on our website. We have spent the last few days getting pretty technical around updating the system with information to the let user know what’s going on. 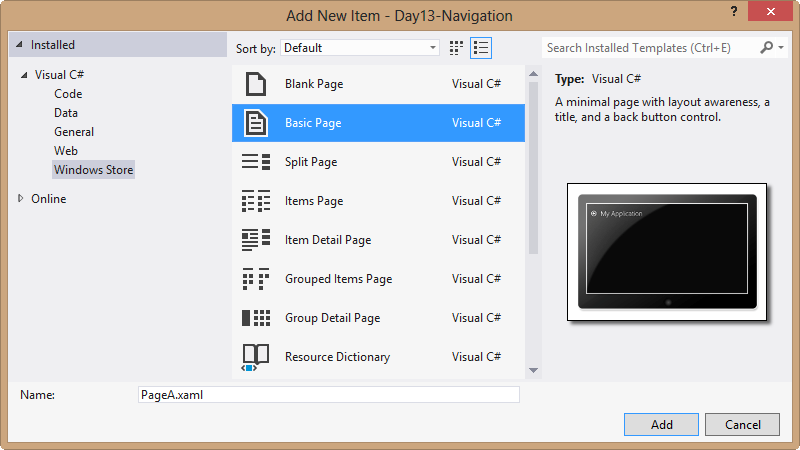 In fact, in the first 12 days of this series, we’ve spent very little time talking about how to do one of the most common activities we’ll encounter in Windows 8 development: navigating between XAML pages. The simple act of navigation from Page A to Page B. What happens when, and what information is available to us? Passing data from one page to another. This doesn’t just include strings and integers, we can also pass entire objects between pages. Caching pages. When a user clicks the back button, they don’t want to discover that all of the data they entered has disappeared. We’ll discuss this more later. 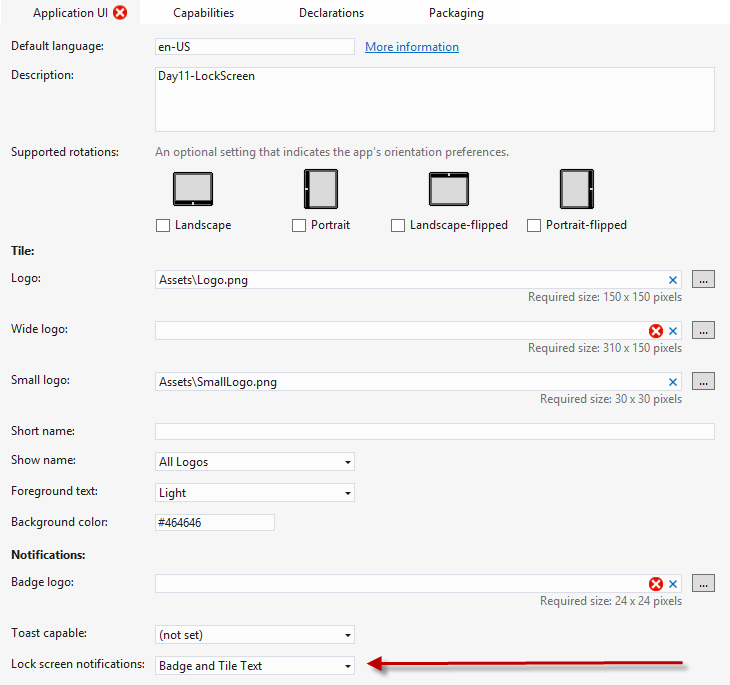 It seems that every time we encounter a new platform, there’s also a new way to navigate between pages in a XAML application. Windows 8 is no different in that regard. This process is easily explained by walking you through creating some pages, so let’s start there. 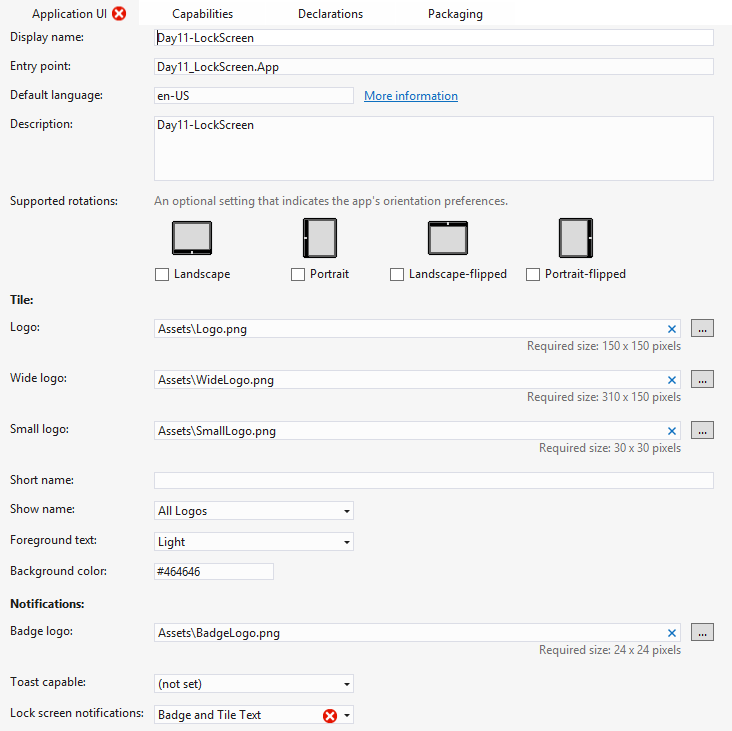 Create a new Blank App Template, and then add two new Basic Page items to it. For this example, you can call them PageA.xaml and PageB.xaml. In each of those pages, there is a line of XAML that sets the AppName. 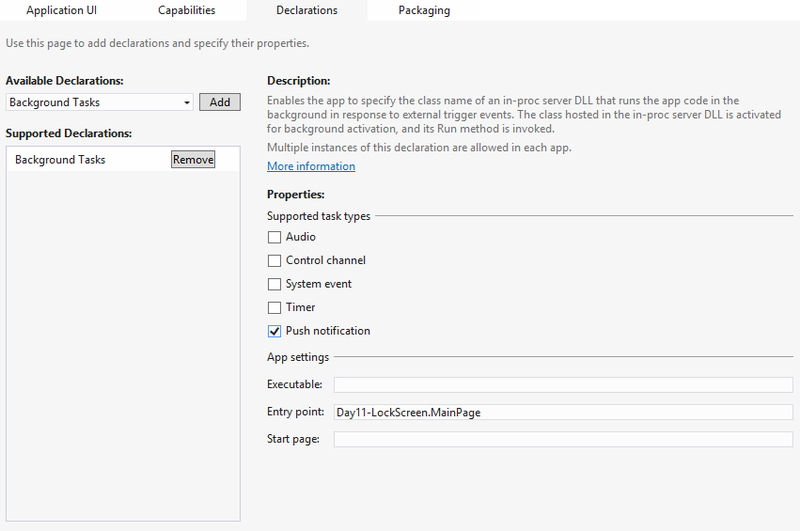 This will cause your application to start up with the initial page being PageA.xaml. At this point, go ahead and run your project. You should see it start with the Splash Screen, and then PageA should load. You should also notice that even though our preview in Visual Studio 2012 shows an arrow icon next to our page title, it is bound to whether or not the page is capable of “going back” with the Frame.CanGoBack property. We’ll talk more about that a little later. On the other side, on PageB, we need to catch this data and display it. Again, I’ve added a TextBlock in my sample code (which you can download at the end of this article), but the important piece is my new OnNavigatedTo event handler, and catching our data as it arrives. In PageB, we can grab the passed value from NavigationEventArgs.Parameter, where I am casting it as a string value. You will need to cast your value to the appropriate type before you can use it, but once you have, you’ve tossed data from one page to the next! The last thing we want to look at related to navigation is page caching. For this final example, I am using our sample application in the state where I was passing string values back and forth. You may have noticed, if you built your own sample app, that if you type something in the TextBox on PageA, and send that data to PageB, when you click the Back button to return to PageA, it doesn’t remember what you typed in the box. This is an incredibly frustrating user experience pattern that you see on the web all the time. After you set the NavigationCacheMode, you will find that your TextBox values (and everything else on your page) will be cached in the back stack. Give it a try…it’s a much better experience, and doesn’t require us to populate and repopulate the form every time the user returns to the page. 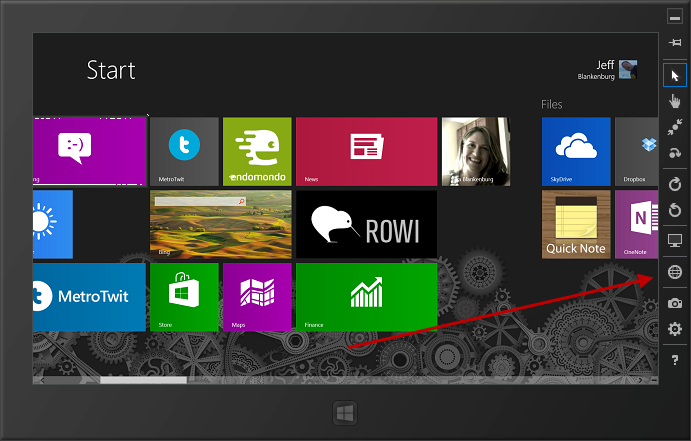 This was an extensive overview of navigation in XAML apps for Windows 8. We covered moving between pages, passing data between pages, and caching those pages for when the user clicks the back button. Tomorrow, we’re going to start our conversation determining a user’s current location using GeoLocation, including the rules that go with using this technology. See you then! 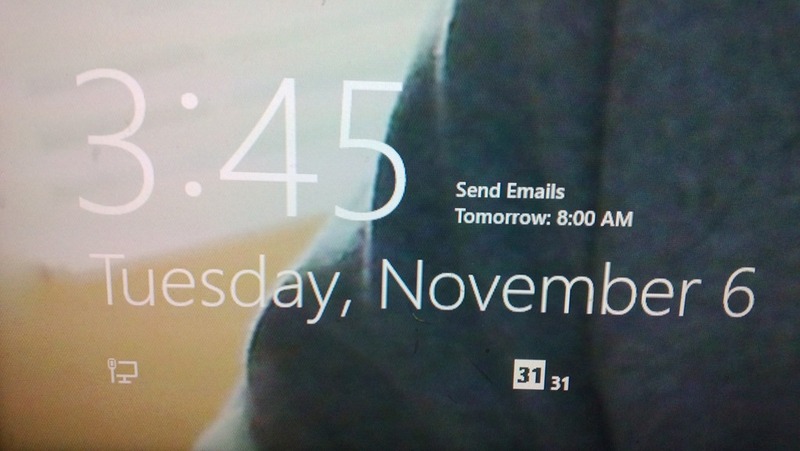 This article is Day #11 in a series called 31 Days of Windows 8. Each of the articles in this series will be published for both HTML5/JS and XAML/C#. You can find additional resources, downloads, and source code on our website. Yes, that’s a photo of my screen. I spent 30 minutes this morning hunting for a solution to take a screenshot of my lock screen, and was unsuccessful. (Yes, I know I could fire up a VM, or remote into my machine, but I don’t have any of that stuff set up right now.) Anyways, you can also see that I’m only writing this article a few days ahead of publication time, and I have a meeting in 30 minutes. We, as developers, have the ability to add our badges to this lock screen as well, but it’s dangerous to go alone. Take this. 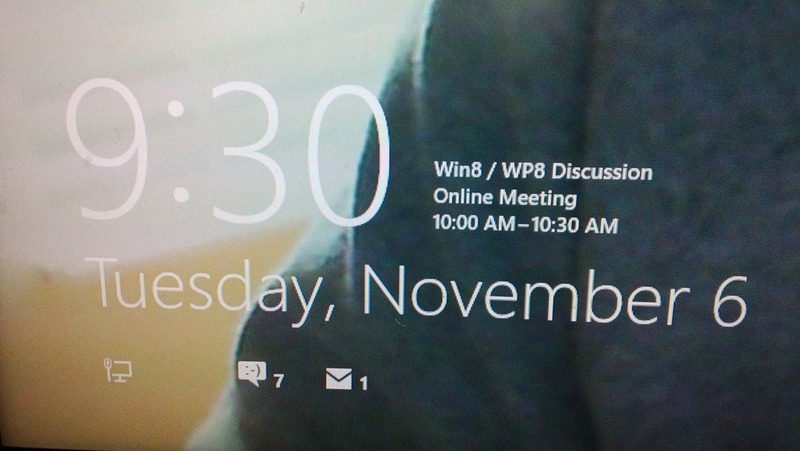 It’s Microsoft’s guidance on the best ways to utilize the Lock Screen notification area. In my example app, we’re not actually going to create a background task, however. I’m going to cover that extensively tomorrow. Instead, we’re going to focus specifically on the processes and code that allows us to update our Lock Screen information. 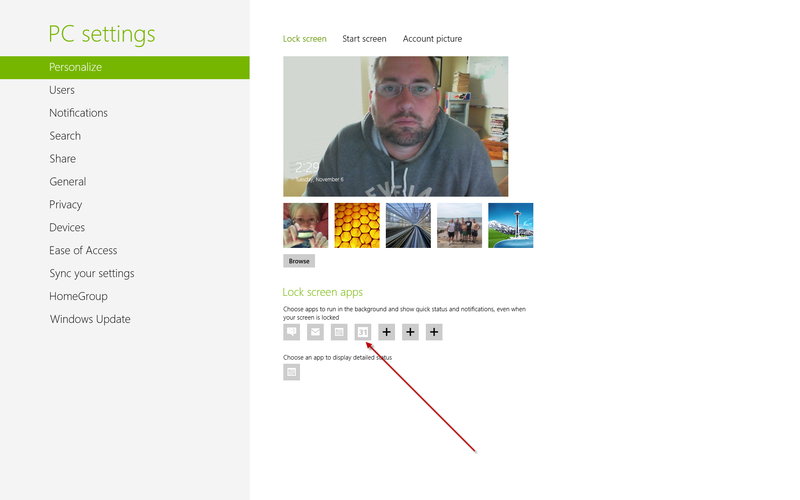 Users can select up to 7 apps to be displayed on their Lock Screen. We want to make sure we’re one of them. So, because our status can change at the user’s whim, we should be responsible before trying to send updates to their Lock Screen. This is not a required step. You can have your app, or your background task (as we will cover tomorrow) continue sending updates even if you don’t have permission. That being said, your updates also won’t ever be seen by the user. Without permission, your updates will disappear into the ether. So at this point, we’ve covered asking the user for permission, and then checking to make sure that permission has been granted. The next step is actually sending the update. 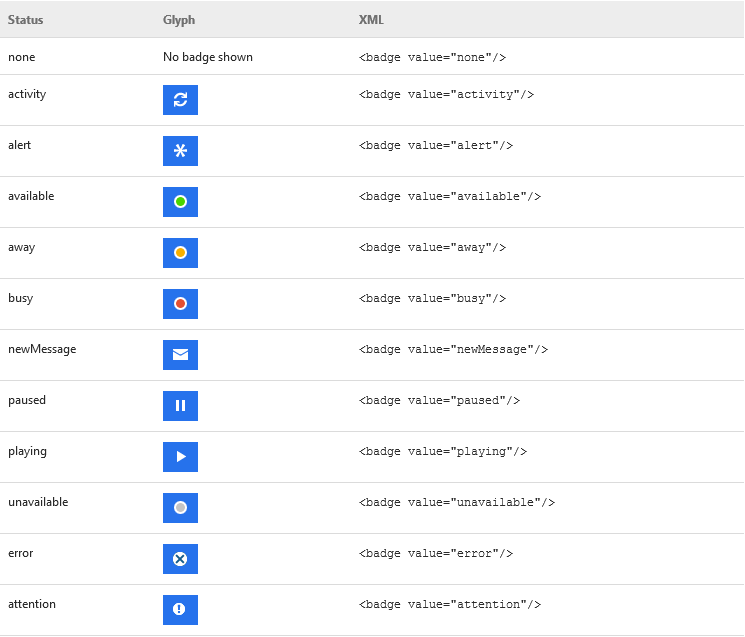 If you would rather use one of the glyphs, here’s a list of what’s available, courtesy of the Badge overview page on MSDN. We can update our Lock Screen information from our app at any time, but the tricky part is getting the user’s permission. Once you’ve gotten that, updating the information is pretty simple, as we saw in this article. Tomorrow, we’re going to wrap up the last three days by talking about Background tasks. We’ll show how to update Live Tiles, Toast notifications, and Lock Screen data from a background task. See you then!